It looks like the randomizer breaks some loading zones. Specifically it broke the south river village and leaves it in an endless loading loop. Removing the mod let me into the zone. I saved at the crystal but the zone is still broken once I reinstall the mod. Tested with three different random seeds on Recommended settings. Lol don't know if guns are just broken or I broke the game but started with a sirius 90AP wind element with Mud shot bullets 56AP water element on hit sap and im doing between 50-75k dmg on every enemy. Glad you're enjoying it so far! I do like giving all the options as sometimes even I like to mix it up a bit. And yeah, the attack power randomization is a little broken. It'll be improved once I put out the next update! hmm yeah. quick hit/cast are definitely op. Since I'm going to add settings to adjust the chances of status effects, I could do the same for the augments. so quick hit/cast can be made very rare. I watched a YT video on this mod(https://www.youtube.com/watch?v=ni3_YwejbZE). There the guy got AOE basic attacks through this mod, which seems really interesting. It seemed like AOE basics can only be applied on all NPCs at once. Party members, monsters etc. My question being, is it possible to make a certain character have AOE Basics, example Basch only. Then only a certain weapon class, example spears or poles? Or only on a specific weapon, example being Excalibur? As far as I know, that is not possible. What is happening is the mod is changing the "Attack" ability's AoE, so everyone that uses "Attack" now does AoE. Thanks for your answer. Thats what i expected. I would also talk about one other small mod i tried to add on Uhlan. Cause i like the job, its effective and strong, but kinda bland. So i wanted to add Jump as an ability. Well the dream would be to get Uhlan to jump like those Green bar NPC Bangaa hunters , they even have spears iirc. You meet them near Rabanastre Desert areas or Giza Plains. All i got working was the charge time and stuff. It looked like a spell casting animation, also had stomp effect on the enemy, but thats all. No damage or anything. No jump animation. Im guessing that cause Jump is an enemy ability. It has only coded animations for enemy beast characters? Not sure, would appriciate your say on this. Can it be added like those Bangaas do it? I would expect the actual jump animation to be tied to the enemy using it. So I doubt you can make good looking Jump ability for the players. "Due to conflicts, item descriptions were removed." That makes this difficult...what do I do? 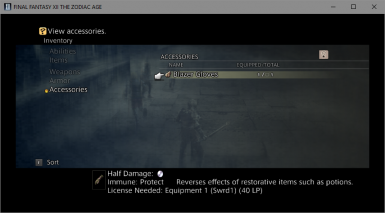 since items have not been modified, and if you are not familiar with FF12's items, look them up in a wiki. Really liking the mod, and the level of customization it provides. One small issue though, is there any way to make NPCs unaffected by the growth/shrink formula for stats? Its causing some hilarious but unwanted results around towns. Yeah the npcs being affected by the size change is unintended, but I kept it because it in since it shouldn't cause issues and I don't know how to check for it exactly. If I can figure out how to not have this happen then Ill add it as an option. The size is a fun flag anyway! But if it causing issues, then that's something else. I tried the mod again with the latest version and encountered a game-breaking bug : my characters all start without equipment, and naked Vaan couldn't deal one point of damage to the rats. I don't have the seed right now since I'm at work, but I'll give it to you asap. The only thing I wanted, iirc, is that the starting equipment wouldn't be randomized so my characters don't start with op stuff. I still managed to make it through thanks to Cheat Engine, with a 1-hit kill code. Speaking of Cheat Engine, I can't play without it because it gives you the option of always looting a certain category of items when opening a chest (you have these options : diamond armlet common item, diamond armlet rare item, no diamond armlet common item, and no diamond armlet rare item). So basically, to not feel screwed by RNG when I open a chest, I set this option to "no diamond armlet rare item" for most of the game, and change it to "diamond armlet rare item" in diamond armlet areas like the Cerrobi Steppe. My question : would it be possible to simply remove the chance for gil and to make it so you can only get one item in a chest, no matter your equipment / abilities (ie removing this common/rare item annoyance and the diamond armlet special ability) ? yeah, once you can, send me the seed and flags and I can check it out. When I've had Vaan unarmed, it is possible to kill the rats. It just took a while before he starting dealing decent damage. But then again, maybe that's not possible for your seed/flags. The reason I'm not making chests give 1 item is for farming purposes. The random chances slow down the farming method. If I could make all chests non-respawnable I would do this, but it's not possible, sorry. Thanks for your reply, Bartz! As for your reason for not making the chests give only 1 item, I understand. Though I'd argue that this is a single player game, and if someone goes out of his/her way to farm, why not let them? I myself never farm, only opening each chest once, but I don't see the harm in leaving this option for people who want to use it. Isn't the point of this game to have fun, by yourself, in whatever way you want? 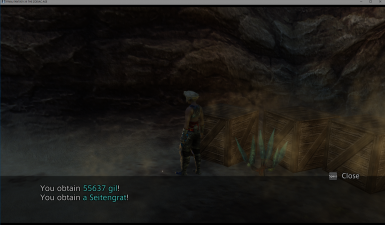 And by the way, even in your mod, if someone finds a Seitengrat in a chest and wants to get five more for all his team members, he can still do it anyways - the current configuration will just make him waste his time a bit more. Oh, studiying the treasure list (awesome work, by the way!! :D), I just realized these options from Cheat Engine mess with the way you organized everything. Looks like the "no-diamond armlet" items are most of the time inferior to the "diamond armlet" items now, and that the rare diamond armlet item is also better than the common diamond armlet item most of the time. So the "Obtain better loot from chests" effect almost never gives worse loot anymore, huh. I feel like a fool now, and you can safely dismiss my above post ^^ (and I'll say goodbye to Cheat Engine when I'm using your randomizer). Keep up the awesome work, Bartz! Sorry for the triple post, but I fear that you wouldn't see my post had I just edited it. 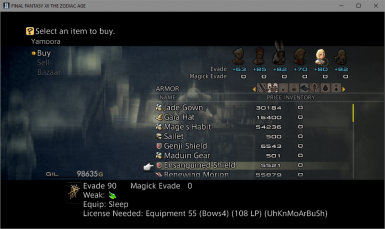 So I've been playing without cheat engine, and I still have a couple issues with treasure chests : their chance to spawn and their gil chance. If you have the ability and time, how about making them always spawn and eliminating their chance to give you gil? My reason : when you know the game well, you know where chests spawn. And going there to find absolutely nothing is an awful experience. If you're OCD like me (and I'm sure most FF players), that just gives you the urge to leave and reenter the area a couple times until you manage to open the chest at least once. - the "no diamond armlet common item (50%) : make them all drop an item, like Potions, Antidotes, Phoenix Downs, etc. They're never a waste, especially since it's sometimes hard to find them in shops. - the "no diamond armlet rare item (50%) : make them give a piece of gear / a spell / a magick / technick. - the "diamond armlet common item (90%) : make them give the same item as the "no diamond armlet rare item". Ie the same piece of gear, spell, technick as the one you'd get half the time if you don't have the "better loot in chests" ability. - the "diamond armlet rare item (10%)" : make it give you some high-level stuff. I think this idea, combined with the fact that chests would always appear and would give neither Gil nor gambits anymore, would be awesome and would make me definitely drop Cheat Engine. FFXII's chest system is indeed awful, but as long as we can't make chests non-respawnable, I think this is the best we could do. What do you think? But yeah, treasures in the randomizer already work differently than normal. It's already based on a "gil range" per level of treasure. So common 1 has the lowest, diamond rare has the highest worth. This will be more clear in 1.5.0 of the randomizer, where the tiers are 2000, 12000, 30000, and 50000. I did the buff the amount of gil that treasures give in the next version too, so it'll be worth something. I also made most treasures have a spawn chance of 70%, which I think is reasonable. Granted, there are now sliders in 1.5.0 where if the slider is at 100%, then the spawn chance is like rolling a 100-sided die to determine the spawn chance %. But what's a randomizer without that feeling occasionally? But again, the treasures in the randomizer work differently than normal, so I would recommend giving it another chance in 1.5.0 once it's out! If more options are needed, I can add them, but I don't want to add too many as then it starts feeling like there's too many options for you, and it also makes it a bit harder making sure every combination of flags works as expected. You're welcome, thanks for your reply Bartz! Yeah, a spawn chance of 70% is great I think. Overall, I like all your changes and I'll definitely play 1.5.0 when it's out! Oh, and did you have any luck with the monsters' stats & appearances randomization? so 1.5.0 is coming out like very soon. within the next 10 minutes. Enemy randomization covers stats, enemy size, and drops/steals/poaches and monograph/canopic jar stuff. But yeah, hope you enjoy the new 1.5.0 version coming out! I was wondering if a couple things were possible in the future. First, would it be possible to save the location of the FileSizeTables folder so we don't have to select it each time? 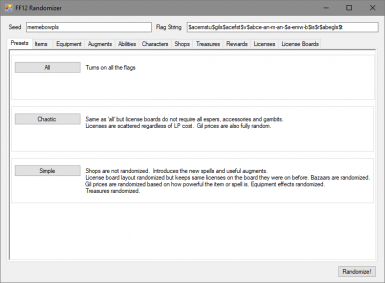 Second, do you think it would be possible to perhaps allow users to use custom license board layouts but still be able to use all (or most) of the randomizer settings for the licenses and boards? Perhaps even an option not to randomize quickening/esper locations since those are often used as locks? Yeah, I'll definitely make it so the program remembers the FileSizeTables location. As for custom license board layouts, that can be done with using custom data instead of the default...but you would need to copy the default data and then overwrite the boards. Which isn't something most users can do. Basically, data packs/other mods can be used with the randomizer. The closest option is to do what's mentioned above and not randomize the license boards, but randomize the licenses. I'm hesitant to add options for literally everything as that not only makes it a bit confusing for players...but also makes it harder to make sure all the flags work together without breaking something or acting in odd ways. I installed this mod, but I can't seem to start a new game. Amusingly, I get a GAME OVER right before the first FMV plays after starting a new game, and then the game blackscreens during Ondore's first monologue. If I load a save after that(during the Reks transition to Vaan), the game hangs on an infinite loading screen. Any suggestions? Notably I wasn't able to install the mod via DrakLab(had to manually unpack/merge/repack), so that probably has something to do with it, but I'm looking for any suggestions. Hmm...what error happens when trying to load the mod with draklab? Also, there's a readme.txt file in the mod folder that's generated. What does that file say in it? Running FF12Randomizer with Wine (64 bit): Program can't load the FileSizeTables(cross threading exception). 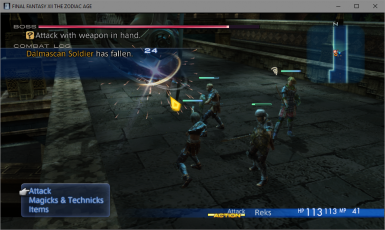 Running FF12Randomizer with Wine (32 bit): Everything seems to work properly. This is what I used to get my randomizer files. Running DrakLab with Wine (64 bit) - Program can't load the VBF at all(cross threading exception). Running DrakLab with Wine (32 bit) - Program loads the VBF and gets to the point of injecting mods, but it uses ffgriever's tool to do this, and the tool is 64 bit only, so the injection fails because Wine tries to run it in 32 bit mode. Running ff12-vbf.exe with the -r argument with Wine (64 bit) - Program seems to run just fine, and it actually changes the SHA1 sum of the VBF file(indicating it did SOMETHING), but the randomizer is actually not implemented, and everything starts as if nothing was installed if I run TZA. Running ff12-vbf.exe with the -r argument with Wine (32 bit) - Program fails to run, as it's not supported by 32 bit architecture. My last option was using tek547's manual VBF unpacking/repacking tools. After unpacking, merging the randomizer's ps2data folder, and then repacking and running the game, at last there were changes - but that's the situation I find myself in today, with the above errors(cutscene crashes/hangs, GAME OVER). Note that any issues I'm having are probably Wine's fault rather than the programmers'. This fiasco is just the result of working around those issues. For info on the bazaars and treasures, check the documentation.html file! Everything seems to be output properly from the randomizer(read: I checked the sha1 checksums and they differ between the vanilla files & randomized files). If I load a vanilla completed save using the randomized VBF, all the random changes show up just fine, there are just cutscene crashes when starting a new game. What I'm going to try next is running the VBFTools in wine32 instead of wine64. I think I ran them in wine64 before and the bugginess of wine64 might be contributing to the issues somehow. Update: I went through the unpacking/merge/repacking process running tek547's VBF tools in Wine32 instead of 64, using a different randomizer seed/data set, and reproduced the same issue I got in the OP. I'm not really sure what's going wrong. I'll try running FF12 Randomizer via Mono(natively, in other words - I feel like something's going wrong with the FileSizeTable, as the randomizer should not be messing with cutscenes at all), getting the random data from that, and trying again. Also, one question: If I turn on "No Shops", can I still sell loot and obtain Bazaar items, or does that option disable Bazaar, too? Update 2: FF12Randomizer gets stuck on the FileSizeTable input if I run natively via Mono - I'll press OK after selecting my FileSizeTable folder and it will prompt to select a folder again. I can't really think of anything else to try. I'll see if I can use a friend's Windows install and apply the randomizer on there, to rule out any tool issues. Maybe Steam Proton(what i'm using to run the game) is the issue? Update 3: Transferring the tools/VBF/filesizetables to a flash drive and trying it on a Windows PC makes DrakLab inject the mod properly! I transferred the VBF back to my install and it works perfectly, so that rules out any problems with Steam Proton. Amusingly, my wake up call was Reks being stuck with Stone/Sleep as soon as I loaded the game up to the introduction. making it impossible to progress. Oops. Luckily I still had an autosave from after the intro, and Vaan thankfully rolled an Obelisk as his first weapon instead of some crazy statused-up item. Thanks for all your hard work in making a randomizer. I'd like to get it to work natively on Linux, but something is just busted between the three different modding tools that makes it impossible. Too bad. Sorry for the late reply. I've been a bit busy. Glad you got it working! Good to know the programs don't work so well on linux. I'll have to check these flags and seed out. Ah, I changed my seed out when I was debugging the program. The seed I got a bugged Reks with is 1543893725, flags $cemrstu$ils$acefst$v$abce-an-m-an-s$a-emnw-b$is$r$aegl$t . I'm loving my time so far! I just got out of Barheim Passage. The game started me with a Koga&Iga blade, and Bone of Byblos on both Balthier and Fran. Thats pretty ridiculous, but very funny. At first I didn't have any way of healing, so it was rather balanced, since I could one-shot everything, but was unable to heal, so ANY hits from an enemy were significant. When I got into Barheim Passage, I used a random number generator to choose who was getting which license boards, and I took away their OP weapons in favor of weaker ones. I can use my 99 ethers I grabbed to heal with Regen(My regen has a very high MP cost) or I can use a Gil>MP accessory instead. All of the armors I had early access to had auto-stop, auto-petrify, auto-confuse, or no-exp. Funny stuff. I do like my 7MP Darkra though lol. The file says the 2nd board is forced to be accessible at all times, but how do I go about that? The option to take a 2nd board isn't on any of my licence boards currently. The option to have randomized enemy stats would be icing on the cake for this. So the second board licenses don't show up until after you beat Belias. Enemy stats are something I'm slowly looking into as it's relatively complicated to the other data being randomized so far! Weird...I assure you I didn't put any malware in. Not to mention, nexusmods says the files are safe and were manually verified to be safe. False positives are very frequent in these kinds of executables.